The last time we invited R Balakrishnan (Balki) for lunch, soon after he'd made his debut as a director with Cheeni Kum, he had all the time in the world. And so, we had indulged ourselves in this long, leisurely lunch with lots of food and beer at the Konkan Cafe, his favourite restaurant. This time around, however, it was a rushed affair at the Vongwong restaurant in Mumbai's central business district of Nariman Point. But after the thrill of having Ilayaraja score music for a second film and some rave reviews for Paa, Balki's on a new high and probably doesn't need the beer. After a month of post-production work and promotions for Paa, Balki's just back at Lowe Lintas India, of which he is the chairman and chief creative officer. But with the amount of detailing and time that Paa required, it's been a strenuous effort, and so, he's not working on a third script right now. In fact, wife Gauri, also an advertising person, may beat him to it behind the camera this time, because she's already started working on a script. For now, though, the two are off to Australia to watch the Boxing Day test match in Melbourne and see Ricky Ponting bat; Gauri's going to be forced to watch cricket, he chuckles, gleefully admitting that he peeked into her script when she was out of the house. Does he give her advice? No, he says, her style is completely different. "By nature, I like to say things differently, perhaps twist things a little. And I'm very casual, I try and make serious issues frivolous." That comes through in Paa, I say, but how did he hit on the idea of progeria? Before he can tell me anything, the waiter butts in and we decide to get the ordering out of the way. It's a spartan meal -- a tom yum soup for my guest, a clear soup with vegetables for me, a plate of dim sums and some baby corn and mushrooms tossed in garlic and pepper. Balki says the idea of progeria didn't really come to him at first, what he had wanted to do was to reverse roles and get Amitabh to play the son, and Abhishek the father. That, he says, happened when he was with them in their office and Abhishek was trying to say something wise while Amitji was pulling his leg. Although he toyed with the idea of a fantasy film, the fun, he felt, would be in a real medical mystery. Finally, it was a doctor friend who suggested he explore the idea of progeria. Despite shooting overseas, you managed to make Paa on a fairly small budget of Rs 15 crore, I point out. "It wasn't really so tight," he says, "it was enough." How is it, then, that other films claim to have budgets of Rs 50-60 crore? Balki believes most figures are exaggerated because people just want to say it's a big film. "They don't seem to understand that bigness is not in the cost of the film, it's in the film." Also, he points out, the cost of a film is mainly in the stars and since this was an AB Corp production, that cost was low. "Otherwise, stars were charging exorbitant amounts when the industry went through a pseudo-boom phase, though now it's settling down. No one's going to get that kind of money ever again. The market just can't take it," he says. 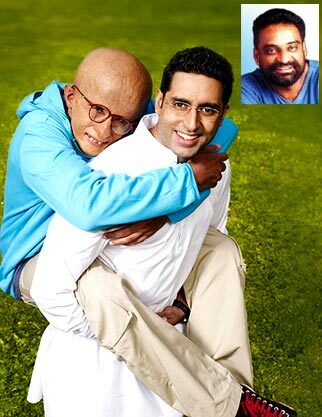 Is Abhishek a good businessman, better than his father? Surely better than his father, says Balki, but he too doesn't really enjoy being a producer, though he wanted to produce Paa. "Initially, Sunil (Manchanda) and I were supposed to produce the film, but finally, AB Corp and Sunil were the co-producers. And, of course, Reliance is the distributor, though it hasn't really bought the rights outright, it's working on commissions." Balki says they haven't also spent much on marketing -- about a third of what others would have spent on promos. And, as a strategy, they decided to use the voice of Auro, and not the face of Amitabh Bachchan, to promote the film. He believes the film got a lot of publicity possibly because of the many talking points, especially Amitabh's look and the fact that Abhishek was playing his father. We talk about how companies, in the hope of boosting their share prices and probably to sell out, have been producing and acquiring lots of films, with the result that they've made very little. But it seems to be the distributors, and not so much the producers, who've lost out because they acquired films at ridiculous costs, I say, and so even hit films haven't fetched them too much. Balki agrees. He, however, believes that even if a producer makes money from one film, people are not going to pay that kind of money for the next film after they've lost so much. "Today, a film is a hit when the producer recovers money, earlier it was a hit when the producer made money," adds Balki. Why, then, companies continue to buy one expensive film after another, I ask. "I don't know. If you have five or six films that don't make money, it's tremendous pressure on a corporation regardless of how much money it has. Even Ghajini, though it did recover money, didn't really make the kind of money it was supposed to." The other observation he makes is that, today, only the stars are paid whereas writers are not, which is why some of the content is so bad. "Unless we recognise the importance of our writers, we are in deep trouble. If you pay a couple of crores for a good script, it will be more worthwhile than putting up a set for that amount." But, he says, it's also true that people don't write original content partly because of the lack of application and also because everyone wants to be a director. "Filmmaking is a writer's medium. Look back at the Salim-Javed era, see how they controlled the film. The industry is not short of money, it's short of writing talent." Is he attracting enough young talent to advertising? Balki feels things are changing because a part of the industry has been restructured and there is a lot more emphasis on the people who do the advertising; earlier there were archaic structures like client servicing, planning and creative. "The structures may exist but there's so much more emphasis on businessmen who know or contribute to idea creation rather than just do business. That's a huge change that has happened," he adds. The industry, he feels, is in a much better position, even at the time of recession when salaries haven't increased. So, is this translating into better advertising? Not really, because although India was protected in the downturn, clients were playing far too safe when actually that was the time to experiment with creativity. But, not too many have the courage. Those who did, like Tata Tea, gained, but it's damaged some who played ultra-safe. 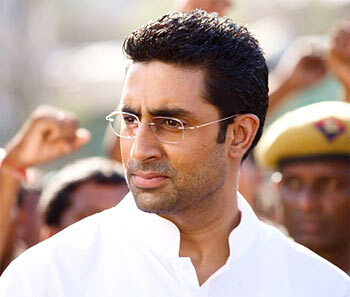 The Tata Tea campaign, which urges the youth to be more politically conscious, reminds me of Abhishek's role as a policitian in Paa, and the criticism of the media. Balki says it wasn't really that. "I was simply looking for an excuse for him (Abhishek) not to go to Delhi. And while it's true that politicians have their own sections of media that spot them and build them up, there are always some currents. Normally, we start off by accusing politicians of being bad, but if there's a good politician, how does he stand out? All I have been trying to say is that there can be good politicians too." The inspiration for the character, he admits, has come from the younger crop of politicians, people like Sachin Pilot. I can sense Balki wants to get back to work and so we skip dessert and coffee, deciding that we must do a south Indian lunch some other time. When politicians got it right!